Are you looking for a family friendly option this Easter? The Redcliffe Festival of Sails is back again this year. Spend Good Friday by the sea at this family friendly event. This year’s Festival of Sails has the added bonus of incorporating the Queen’s Baton Relay before it heads to the Commonwealth Opening Ceremony on 4 April. The Festival of Sails is free to attend with many free and low-cost activities available on the day. Each year thousands of visitors head to Suttons Beach to join in the fun. Enjoy prime position to see the boats sail past the Redcliffe Peninsula as part of the Brisbane to Gladstone Yacht Race. On top of rides and amusements, the day will be filled with great live music and entertainment. Here is a snapshot of family friendly activities to enjoy on the day from 8 am to 4 pm. An Easter Egg Hunt for the kids will take place from 9 am to 2:30 pm by the waterfront. All ages are welcome to take part for a small cost. As long as the weather plays nice the Easter Bunny will make a grand entrance via skydiving in. At 10 am the Easter Bunny will drops in with some chocolate treats for the kids. Be delighted with the Workshop Wonders Easter Show at 12 pm at the Main Stage. Jump in anytime and have a go at Beach Cricket and Beach on Suttons Beach. All day fun from 9 am to 4 pm. Be entertained with this hilarious show that combines amazing illusions with comedy that will have you in stitches. All aboard a magical adventure with Aaaron the Pirate and his Macaw parrot called “ Polly’s gone crackers”. The kids can enjoy spending time in the Pop Up Library. Or perhaps will love spending some time at the free craft workshops. Watch in amazement as a professional Sand Sculpture creates incredible scenes right before your eyes. You’ll also be able to jump in and have a go at creating your very own masterpiece. Plus there is lots of live music from local performers for the adults to enjoy as well as over a hundred market stalls to check out. Being the long weekend holiday traffic is expected to be heavy and parking will be limited. So the best way to get to the Festival is to catch the regular shuttle bus that will operate from the Redcliffe Showgrounds. 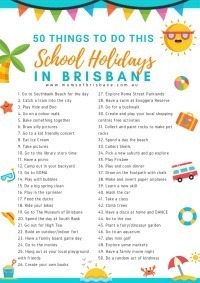 Make the school holidays extra fun with 50 great activities - especially for Brisbane Kids! Weekend Markets In Brisbane That The Kids Will Love Too!